Parking is available at the Elizabeth Parking Authority Garage #6 located at the corner of Jefferson and Dickinson Streets. Please use entrance on Dickinson. Tickets must be validated by the Jury Management Office in the Courthouse. Jurors with disabilities should call 908-659-4622 prior to reporting for directions for handicap parking. For directions to Jury Duty Parking Garage # 6 click here. 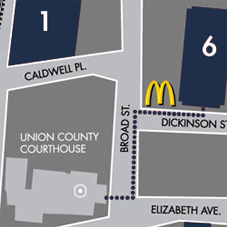 For directions to the Union County Courthouse click here. 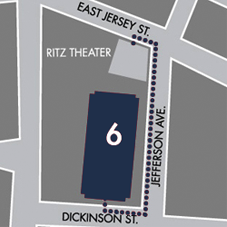 For events at the Ritz, Parking Garage #6 is located right behind the theater. Please use the entrance on Dickinson Street. Flat Fees As Posted. For directions to Parking Garage # 6 click here. For events at the J. Christian Bollwage Parking Garage #1, please use the entrance on Caldwell Place. For directions to Parking Garage # 1 click here. Click on the lot markers above in our interactive map to find more detailed information about each lot. State of NJ Division of Disability Services [.001W/00,1/7] states: When parking at a metered space, a driver with a placard or handicapped license plate must put the appropriate amount of money in the meter. If the vehicle will occupy the space for more than the maximum amount that the meter holds, the driver must fill the meter to the maximum amount. All meters and / or meter boxes have maximum amounts posted on them. This will permit the vehicle to occupy the space for up to 24 hours, and no further payment will be required during that time. A municipality may require the vehicle to vacate the space after 24 hours.